It has been established fact that with the passage of time, Ispahani Public School and College has emerged as a unique place of learning. It has been highly acclaimed as one of the best institutions of the country for its glorious contribution to education. I feel happy about my involvement in running of this illuminated institution. We have modern information & technology based classroom, equipped with multimedia device and interactive board. Our vision is to fabricate our beloved pupils as the competent citizen inculcating the sense of discipline, morality, ethical values, cultural tradition, patriotism, creativity, practical skill to the highest possible level by ensuring standard education. We highly emphasis on the development of students’ healthy self-esteem, positive attitude, confidence, responsibility and leadership quality and after all making them well accomplished human beings so that they can participate in national and international level co-curricular and extra-curricular activities. IPSC website is a testimony of its onward march. I am very much delighted to be a part of this lofty move. My warm reception for you all to visit the website. I am sure this noble venture will strengthen threefold co-ordination. I express my heart felt gratitude to the honorable Chief Patron and the honorable Chairman of the Governing Body for their prudent guidance and advice. I hope Ispahani Public School and College will continue its ongoing journey to sustain its genre of excellence. May Allah always be with us. 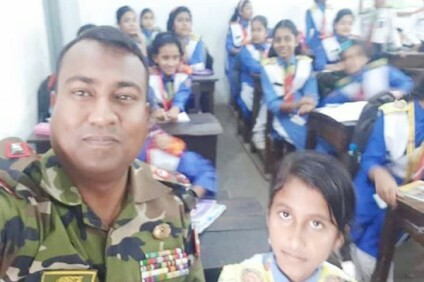 Lt Col ARM Nasiruddin Ekram Principal Ispahani Public School and College Cumilla Cantonment. >It has been established fact that with the passage of time, Ispahani Public School and College has emerged as a unique place of learning. It has been highly acclaimed as one of the best institutions of the country for its glorious contribution to education. I feel happy about my involvement in running of this illuminated institution. We have modern information & technology based classroom, equipped with multimedia device and interactive board. Our vision is to fabricate our beloved pupils as the competent citizen inculcating the sense of discipline, morality, ethical values, cultural tradition, patriotism, creativity, practical skill to the highest possible level by ensuring standard education. We< highly emphasis on the development of students’ healthy self-esteem, positive< attitude, confidence, responsibility and leadership quality and after all making them well accomplished human beings so that they can participate in national and international level co-curricular and extra-curricular activities. IPSC website is a testimony of its onward march. I am very much delighted to be a part of this lofty move. My warm reception for you all to visit the website. I am sure this noble venture will strengthen threefold co-ordination. I express my heart felt gratitude to the honorable Chief Patron and the honorable Chairman of the Governing Body for their prudent guidance and advice. I hope Ispahani Public School and College will continue its ongoing journey to sustain its genre of excellence. May Allah always be with us.